You do not have to wait for spring to set in to do your spring cleaning. According to experts, the ideal time would be towards the end of winter, so that you can make a fresh start when spring rolls in. But the question is, where are you going to put the trash from your spring cleaning? At Jux2 Dumpster Rental, we understand what your needs are, so feel free to call us to take care of all your junk removal needs in Jersey City. A roll off rental service will save you time and trouble because all you have to do is to rent a roll off container and we will take care of the hauling requirements while you continue doing your daily tasks. Many people take on this type of project during a remodeling project or perhaps before a move. Take advantage of our roll off rental service, rent a roll off container, and worry not about the junk piling up on your driveway. At Jux2 Dumpster Rental, we are dedicated to ensuring that we meet every client’s needs, and that consist of defining the best roll off rental sizes for every project. Dumpster rental does not have to be a hassle. Our containers are sized from 10 -30 cubic yards. So one article can be light in weight but if it is bulky, then it must go inside a larger dumpster. Call us at 201-244-4311 and let us help you find the right dumpster size. 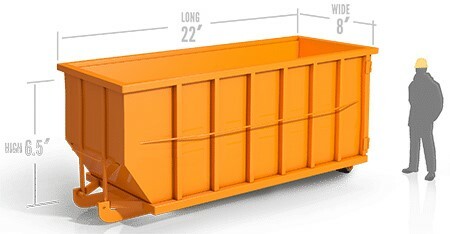 Understanding the roll off rental container sizes and dimensions will go a long way in helping you choose the right dumpster container for your ongoing project. 10-15 Cubic Yard Dumpster: Our smallest dumpster, this is ideal for cleaning out small rooms and basements, You can also make use of containers this size for your kitchen remodeling junk. A single layer roof shingle measuring 1,500 sq. ft. can also fit in this container. 20 Cubic Yard Dumpster: The 20 cubic yard dumpster is a medium-sized roll off container that is a perfect fit for debris from a kitchen or bathroom remodeling project. This is ideal for getting rid of larger items such as mattresses, desks, dressers, cabinets, etc. Both big and small businesses have turned to Jux2 Dumpster Rental to save on roll off rentals. If you are de-cluttering your house, or cleaning up after a major construction job, then you may want to consider a roll off rental. We will provide you with the most suitable dumpster for your needs, making your investment with us a smart choice. Included in our cost-effective pricing are pick up, specific weight limit, landfill charges, and delivery. Call us at 201-244-4311 and receive the right information with regards to the cost of a dumpster. We are excited to take care of your waste removal requirements. Feel free to call us at 201-244-4311 so that you will know the cost of a dumpster and many other things about our rental service. We are always ready to serve your needs. You will want to be properly informed about the necessities that go with roll off rentals. Every city and municipality has special regulations with regards to roll off rentals, especially when it involves where you place the dumpster. Any dumpster container that will be blocking a public right-of-way such as a sidewalk or traffic lane will require permits. Dumpsters may not be placed on a sidewalk, alley or street without a permit. Remember that there is a time frame within which you will be allowed to park the dumpster on a designated area. The city council may also impound the dumpster if you haven’t acquired a permit. Park the dumpster inside your driveway, and worry not a thing about securing a permit. You might be surprised to discover that those permits also cover roll off rental. Do You Need a Dumpster container in Jersey City? Jux2 Dumpster Rental is ideal for a variety of circumstances. So, call us today to obtain a no-obligation quote. Call us and let us talk more about dumpsters for rent. Call us and let us talk more about dumpsters for rent.